The crash happened on the southbound carriageway of the A90 Aberdeen to Dundee road, a mile south of Drumlithie, shortly after 3pm. 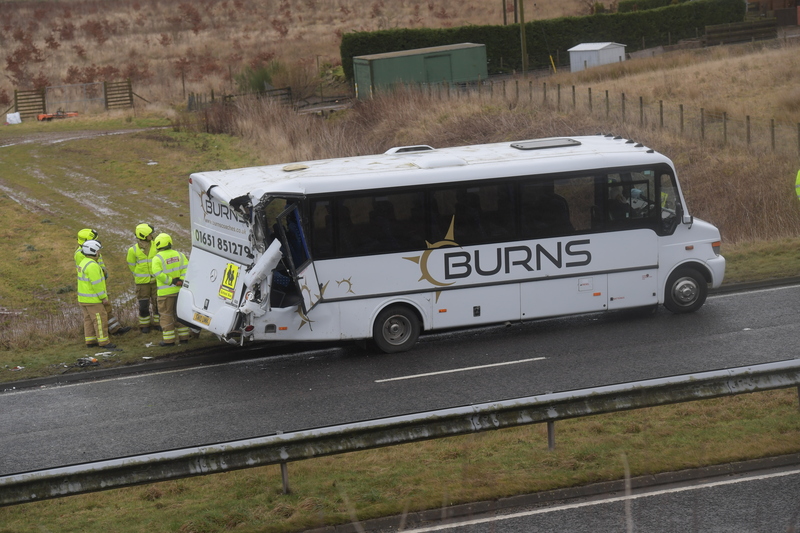 Thirteen teenage pupils from Inverurie Academy were on board the coach at the time of the accident along with two adults. The group had been travelling south to compete against a Mearns Academy team in a football match. In addition to a police unit, two paramedic teams, a specialist road accident doctor and firefighters were also called to assist. Police said no-one was seriously injured in the crash although one young footballer was taken to Aberdeen Royal Infirmary. An Aberdeenshire Council spokesman said: “A bus carrying Inverurie Academy pupils to a football match was in collision with another vehicle on the A90 at around 3.15pm yesterday afternoon. “Thankfully, there were no serious injuries, although one pupil was taken to hospital as a precaution. One lane on the dual carriageway was blocked until after the vehicle was recovered from the road. The school bus, owned by Ellon-based company Burns Coaches, was extensively damaged. The back of the coach was left caved in and the rear emergency exit door was hanging from its hinges following the collision. A police spokesman said: “We were called to a report of a crash between a lorry and a bus on the A90, near the Inverbervie turn-off. “There were 13 children on board and two adults. A spokesman from the Scottish Ambulance Service said two ambulances were sent to the scene along with a BASICS doctor. He said: “We received a call yesterday to attend a road traffic collision on the A90 near Stonehaven.